Ballybunion will always be one of my favourite places to play golf. It is a course I had been aspiring to visit since I was a young boy – no older than Guan Tianlang – when ‘Masters’ referred to teachers with an impressive swing… even if it was only with a cane. I have no idea why, but someone, somewhere, put Ballybunion in my head and it stuck. When I played it in 2008, for the first time, it didn’t disappoint. Which is why I was so intrigued to see how Karl, Kevin and Patrick tackled the course on their first visit. A bit of background to our round: the course had been closed during an Open competition the previous day, due to high winds. We teed off in sunshine and with a strong breeze at our backs – probably a three-club wind. Listen to the videos below and you’ll get a good idea of what it was like. We were enjoying ourselves mightily until the downpour started on the 15th tee box. It’s what you call the 20 second downpour… not because it lasted 20 seconds, but because that’s how long it took to be drenched. Try putting on your wet gear and see how far you get in 20 seconds. Me? I hadn’t even got it out of the bag. It lasted until just before we reached the 18th green. I even offered the lads a short cut from the 16th green to the clubhouse but not one of them was interested. Video: Kevin tees off on the par three 3rd, into the wind. Q. What are your overall impressions of the course? Karl: Everything in excellent condition, real shot-making required, OK for a high handicap. 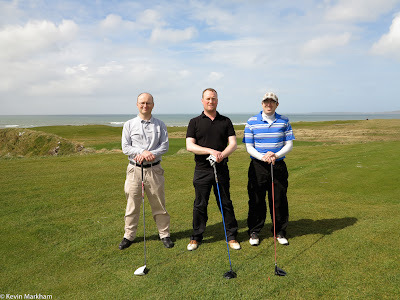 Patrick: Excellent course, probably one of the best in Ireland. Q. What really stood out for you about playing here? Patrick: The layout and shape to the holes especially on the back 9. Q. What did you find most fun/enjoyable about your round? Kevin: Type of shots you needed to play – you need to be creative. Patrick: The fairways are great fun to drive at especially with wind into your face. Playing off 19, Patrick was hitting some big drives onto the fairways. It was his putting that let him down badly. Kevin, off 9, had the ability to be creative, although his preferred weapon around the greens was his wedge. I queried him on it as we stood just short of the par five 4th green, our balls side by side. “I love playing a wedge around the green,” he replied before fluffing his chip. The ball rolled back to him. Then he chipped it into the hole… for a birdie, while I three putted. Q. What’s the best course you’ve played? 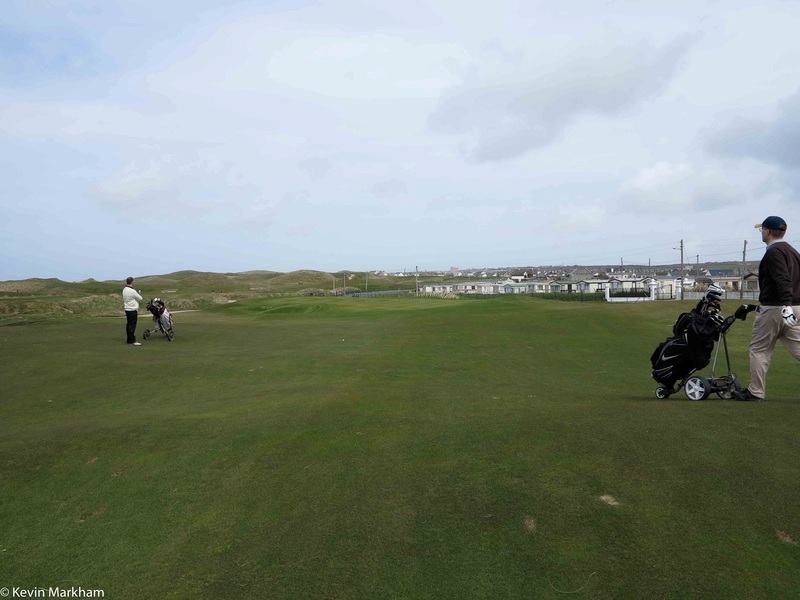 How does Ballybunion compare? Kevin: Carne. Ballybunion is better. Karl: K Club (Palmer). It’s hard to compare. 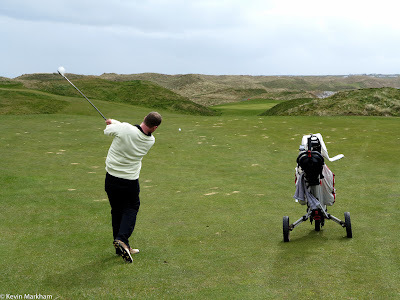 Ballybunion is best links course to date – it’s better than European/Enniscrone/Royal Dublin. Patrick: Enniscrone. Ballybunion would definitely rank on par or slightly above it. Q. How easy/difficult did you find the course off your handicap? Karl: 32 points (3 holes in heavy rain), medium to difficult but manageable off 18. Patrick: Not too bad, found the greens tough and trying to judge pace was difficult. Karl had a barnstorming front 9. He revealed afterwards that he had been told by a friend that, at Ballybunion, you have to score on the opening 5 holes and then hold on for dear life. He did pretty much that. Video: Karl teeing off on the par three 12th - 183 yards. Q. 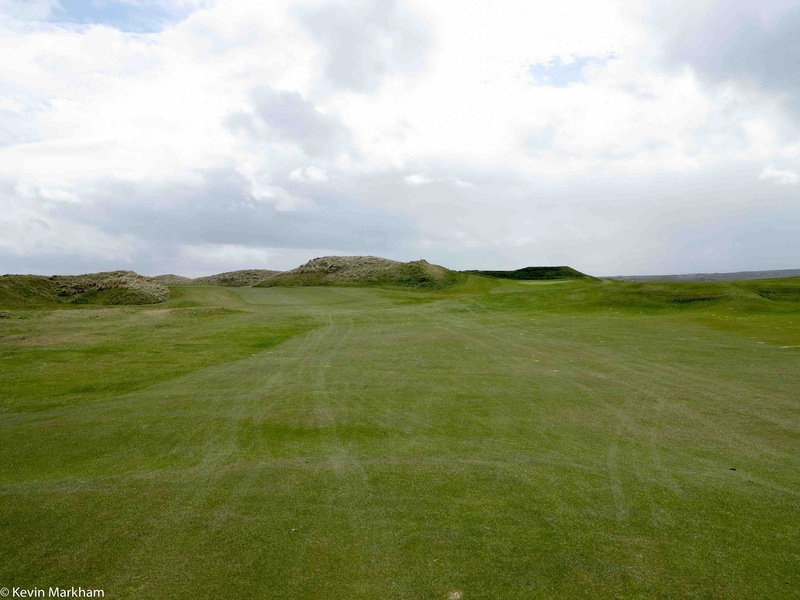 What is Ballybunion’s biggest challenge? Kevin: The elements/putting in the wind makes it very hard. Karl: Wind, blind shots (if playing 1st time unaided). Patrick: The wind, pace of the greens. 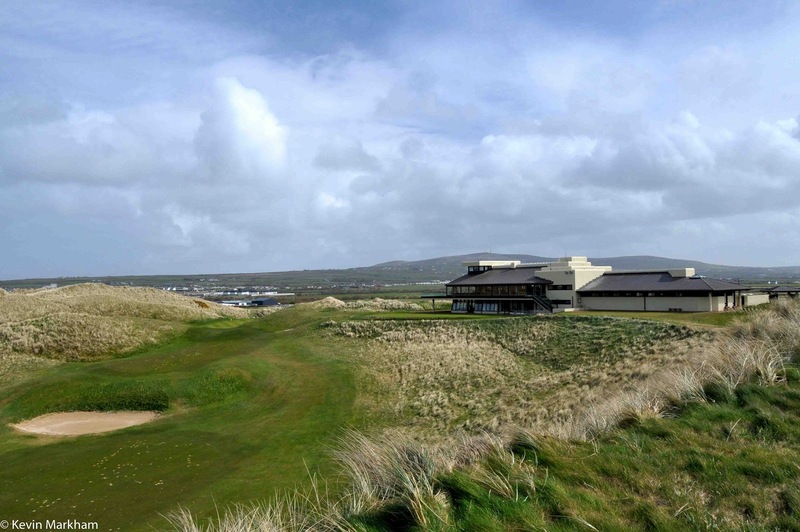 Yes, it was a windy day but, to be honest, that’s what links golf should be. Karl said they would have been lost on many occasions if they hadn’t been accompanied by someone who knew the course (i.e. me). Certainly it helps if someone can point at a distant point and tell you ‘that’s the line’, or ‘watch out for bunkers short and left’. It proves the worth of a caddy. And we only lost three balls between us – all of them between the 16th and 17th when the rain was so bad we barely looked... even for a Pro V1. Soaked but still standing on the 18th green. The flag's only three foot tall. Q. What were your favourite holes, and why? Kevin: 8 as it is all about accuracy. Patrick: 17 and 11 are amazing holes. The shape and changes in elevation are spectacular. 11 is Index 1 and regarded by some as one of the best holes in the world (it’s my best 11th hole in Hooked). It is a rollercoaster of dips above the beach before a pair of sentry dunes protect the green. Two excellent shots are required to reach the surface… and Kevin had a birdie putt. Kevin fires his second into the 11th green. Q. You’re selling this course to someone who has never been here – sum it up in one sentence. Karl: Bucket list of Ireland’s top 5 or 10 courses, mandatory, lovely time. Patrick: Absolutely breath-taking and a super challenge. Karl: Whole golf experience. Enjoy 1 to 5 before you start to feel the course biting back. Patrick: Playing off the mats was a bit disappointing but still didn’t take away from the overall experience. Add some shelters! Shelters would have been a blessing on the 15th and 16th tee boxes, that’s for sure. 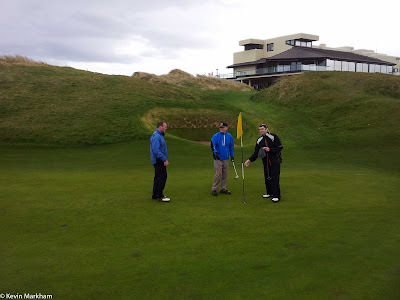 There was a bit of maintenance going on – hence the mats – but the big thrill for me (aside from a 2 on 14) was playing the ‘second’ 7th as the hole has two greens, and playing a ‘second’ 8th as well. Karl: 5. Hard to justify the green fee. Patrick: 7. €95 puts it out of reach for many people especially if you wanted to play more than twice a year. I’m always commenting on the Inside The Ropes ratings for green fees, so I’m not going to repeat myself here… except to say that when you play one of Ireland’s renowned and great courses you’re going to have to pay for it. After we finished and Patrick had revealed an intriguing secret about what he had been wearing for the round, there was a strong interest in the clubhouse’s steam room. We opted for the showers instead and retired to Ballybunion's Spike Bar, to enjoy the rain from indoors. Thanks to the three lads for their company and for paying for my meal. Lasted me all the 180 miles home. Boondock, as with all discussions on 'Links' it's difficult to confirm the true numbers. I would generally accept that 90% of the world's links are within the British Isles, but us having 1/3 might be a bit optimistic. I reckon there are just over 40 courses (18 hole) in Ireland that have links holes (but not all 18 of them necessarily)... yet a book called True Links identifies 246 links courses worldwide (and the authors provide that 90% figure listed above), which would give us 20%. Scotland is a stretch, unfortunately. It would be a blast, for sure, but a bit beyond my (and my wife's!) scope. 'Links' as a term, has become generalised to mean 'golf course' in a lot of places - so yes, lots of courses that call themselves 'links' aren't. Take Old Head of Kinsale - a cracking golf experience, but it's not a links, as much as they like to claim it is.